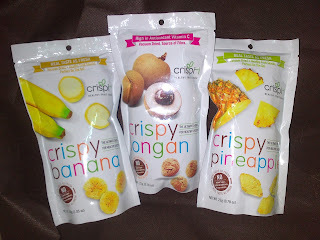 There was freeze dried pineapples, longans and bananas which I have not tried before. It feels really interesting holding a bag of these vacuum dried fruits because I love the clinking noise it makes when you rattle the bag just like pieces of ceramics clinking together and it feels so weightless too because all the water has been drawn out in the vacuuming process. I love vacuum dried items because it keeps the nutrients while the flavour gets concentrated and intense. Usually banana chips are fried so it was good to try the vacuum dried version which are non oily and crispy. The fried version is really hard and not so nice. The vacuum dried Longans were quite sweet but then the fresh ones are real sweet anyway and the colour was interestingly brown. The vacuum dried pineapples taste better than fresh ones because I've never liked them fresh as they were too juicy and the fibres were woody. But as a vacuum dried snack, the fibres are brittle and the pineapple pieces are crispy with natrual tartness of the pineapple.